Vanderbilt Cup Races - Blog - Question of the Week: Can you Identify this Signed Willie K. Photo? Question of the Week: Can you Identify this Signed Willie K. Photo? I have a photo signed by William K. Vanderbilt, Jr. taken, I believe, at Daytona Beach, Florida. The caption reads "Official world's record made by W.K.V.Jr. in this Mercedes car. From 1 to 50 miles, the latter distance accomplished in 40 min. 49 4/5 sec. Date Jan. 1904. W.K. Vanderbilt Jr."
Dwight, your signed photo documents the zenith of Vanderbilt’s racing career at the Daytona-Ormond Beach Automobile Tournament of January 1904. The Mercedes with Willie K. as the driver was shot on the beach with the Atlantic Ocean in the background.The identification of the two other men in the car is still a mystery. Based on other images in my collection, the man with the mustache was “Henry” and the young man initials were “R.C.W. Jr.”. 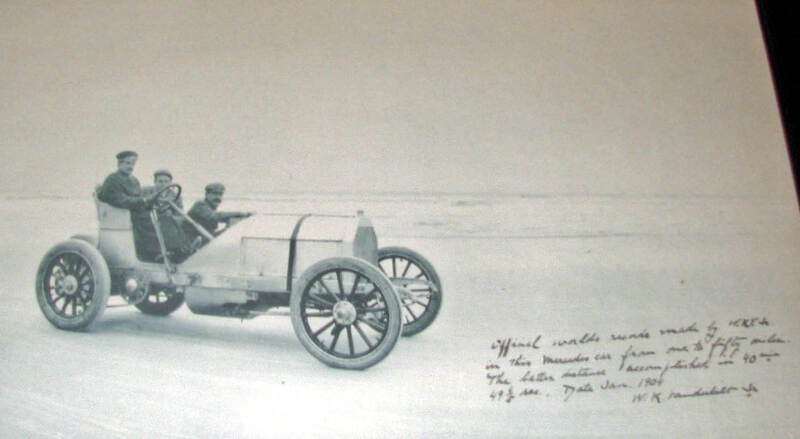 At the 1904 tournament, in addition to seeting the one-mile land speed record at 92.3 mph, Vanderbilt won everything he entered, except for a 1-mile battle with Barney Oldfield. In addition to winning all his elimination heats, he scored victories in the five-mile free for all, the one-mile invitational race, the five-mile invitational, the ten-mile invitational and the 50-mile free-for-all championship. By the time the contests ended on Saturday, Vanderbilt racked up records for 5, 10, 20, 30, 40 and 50 miles. A racing photo signed by William K. Vanderbilt, Jr. is rare and should be cherished as a family heirloom. If it was to go to auction, I estimate the value to be over $2,000. Thanks for the information on the Vanderbilt Cup Races! I think the 3rd person in the picture might be my father. His face is somewhat obstructed by the steering wheel (but,looks like he might have looked in 1904). Also there is a picture of a group of Maxwells dated 1909 at Vendor, N.J.
My brother & sister may have more. I will check.